I am going to embrace my purpose, y&apos;all. Even when rejection fills my inbox; it can&apos;t and I won&apos;t let it, deplete my spirit. I am secure and free to revisit or not. I am secure in my words reaching the world how I see fit, as intended. As mine. Filling the air around me with delight. And don&apos;t I deserve it? To be in bliss and whole. Happy. I want to be happy. I want to jump for joy at the opportunity to live without regret. Even when money is funny. Especially when the temptation of measuring my success by someone else&apos;s value system has me tripping. I know what&apos;s at the beginning of my rainbow. I know what&apos;s at the end of faith. It&apos;s being. It&apos;s living. It&apos;s fullness. And I don&apos;t mind if it doesn&apos;t make sense. I walk my fat blackness about this earth with not a single solitary shame. I embrace all that I&apos;ve got because why else am I here. Why else does my purpose wake me every morning, why else does my purpose allow me a voice, why else am I fierce, why else am I talented and smart and ready and proud and yes, why else am I me. Why else are you, you? Ah-Keisha is senior editor at Duende literary journal. 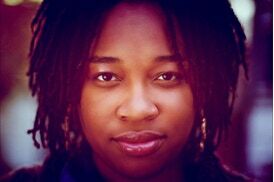 Her bi-coastal NYC/LA upbringing prepared her well for being married with kids in the city-burbs of PA. A poet, filmmaker, playwright, and songwriter, Ah-Keisha has written for television, film, and recording artists Olu Dara and Cassandra Wilson. She’s inspired by the work of Lorraine Hansberry, Bertolt Brecht, Tennessee Williams, Toni Morrison, and Amiri Baraka. She has been featured in Source Magazine, Village Voice, Backstage and the Courier Post. Ah-Keisha enjoys mini adventures with her kids, pointed discourse, laughter, and proudly boasts she’s never had a cavity.